Myriophyllum species are known as Water Milfoils and are members of the Haloragaceae family. Our skill at the taxonomy of this genus leaves a lot to be described. This article will describe Water Milfoils in general as they are very similar in appearance. 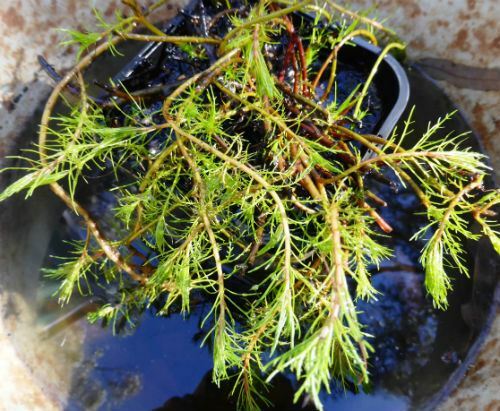 Myriophyllums are freshwater aquatic plants whose distribution is cosmopolitan. There are about 69 species with Australia the centre of diversity with 37 endemic species and 5 naturalised. Water Milfoils are usually heterophyllous: that is the leaves are more than one form on the same plant. When stems grow out of the water the leaves of the submerged stems are soft, finely divided and carried on rather floppy stems that take root at the nodes. The leaves and stems that emerge are stiffer. Plants may be monoecious or dioecious (either carrying male and female flowers on the same plant or bearing male and female flowers on different plants). Flowers are small and are carried in the leaf axils of emerging stems. Myriophyllums provide shelter for eggs and juvenile fish. The genus name means too many to count and refers to the leaves. Propagate from cuttings and division of clumps.